The XCaliber is our world class competition freestyle model. Its high performance comes from the extensive use of structural carbon that stiffens the flex pattern, for increased response and explosive pop. The Xcal’s performance rocker line allows for monstrous drive into powered freestyle tricks while retaining excellent upwind performance. The double concave with cantered rail panels shift into a quad concave tip bottom shape. 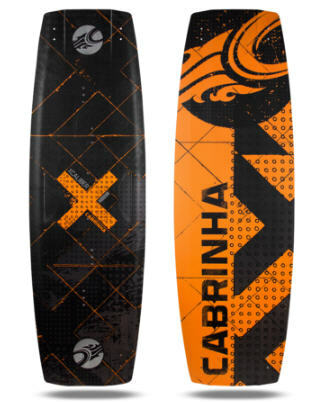 This channels the water flow for maximum edge control, board response, and smooth landings. The progressive 3D molded top and bottom shape gives added dimension to the board. A single pour, ultra-bond liquid polyurethane elastomer around the entire board is the ultimate impact resistance material and helps with rebound and vibration reduction. Designed to provide quick bursts of speed, incredible pop, and the upwind ability to keep your performance spot on.